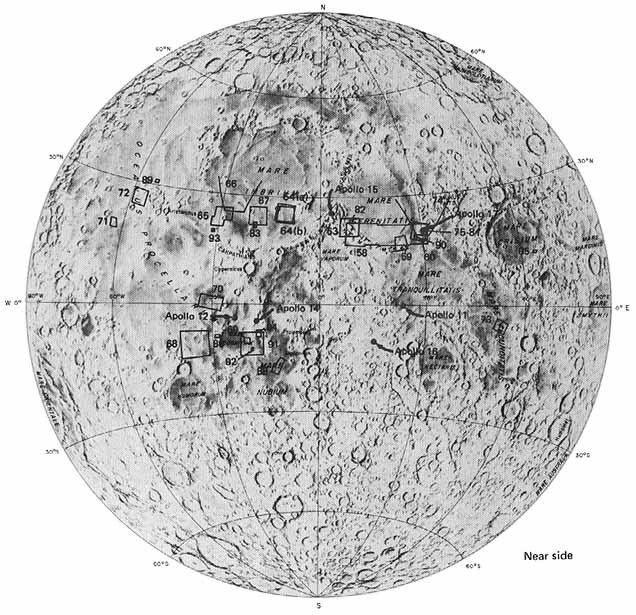 Areas of mare material occupy about 15 percent of the Moon's total surface. As shown in figure 14, most of them occur on the Earth-facing hemisphere. Mare areas are of two types, those that fill multiringed circular basins and those that fill irregular areas. 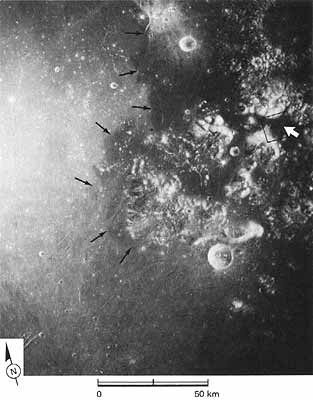 The circular basins are believed to be impact features formed by the collision of giant meteoroids with the lunar surface; these were later filled to varying degrees by mare material. The basins lie at successively lower levels to the east, with Mare Smythii-the easternmost of the mare basins on the near side-lying almost 5 km below nominal lunar radius. The irregular maria lie in lowlands. The largest of these is Oceanus Procellarum, which lies on the west side of the Moon and is almost 2 km below nominal mean lunar radius. Mare filling is characterized by several distinctive features that indicate a volcanic origin. These include many broad low domes with summit craters. Some of these domes closely resemble terrestrial basaltic shield volcanoes. In other areas, irregular and steep-sided volcanic piles dominate. Elsewhere, clusters of domes occur as in the Marius and Rumker Hills. Another type of feature is the broad lobate flow fronts that mark the edges of lava flows; these flow fronts extend several hundred kilometers in length and are as much as 100 m high. Other elongate flows closely resemble terrestrial flood basalts; samples returned by Apollos 11, 12, 15, and 17 confirmed this resemblance. Other typical features on the maria are sinuous rilles and wrinkle ridges. 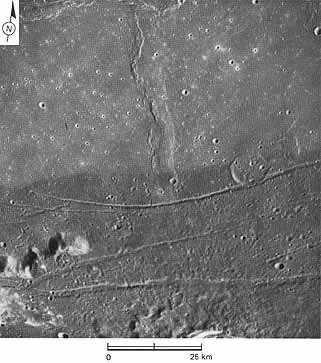 Many sinuous rilles originate in craters near the higher margins of the mare basins and flow into the lowlands. 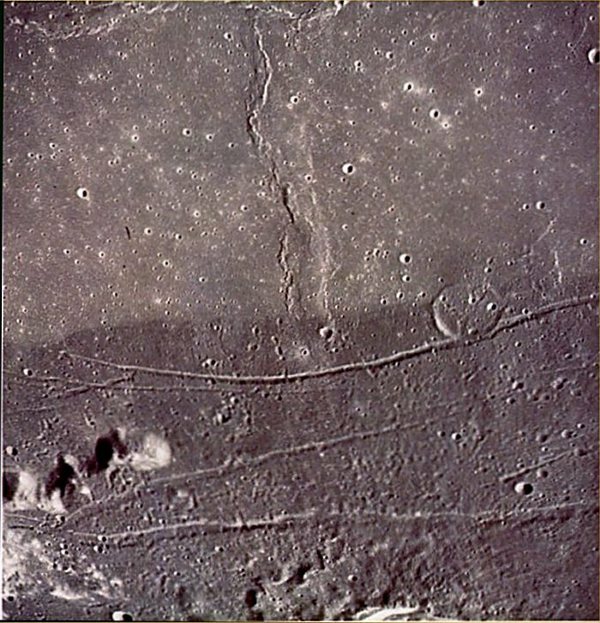 Apollo 15 collected samples from the margins of Hadley Rille and confirmed the hypothesis that sinuous rilles are basaltic lava channels. Wrinkle ridges occur in all mare regions and form circumferential or medially transecting patterns. Ages of the maria are being determined by two methods. Absolute ages are given by radiometric techniques. From these we know that the sampled lunar basalts are much older than their terrestrial counterparts. The basaltic lava flows range in age from 3.15 to 3.85 billion years, so the episode of lava filling on the Moon must have continued for at least 700 million years. Relative ages can be established by counting craters in mare surfaces. Comparison of crater counts on the lightly cratered lava flows in the northern part of Oceanus Procellarum with radiometric dates obtained for the basalts returned to Earth suggests that the Procellarum flows may be as young as 2 billion years. This date needs to be confirmed because it more than doubles the time of lava production. Analyses of the returned samples show that the chemical composition of mare basalts varies across the Moon. These differences have also been correlated with the subtle color changes seen in spectral reflectance measurements; as a result, chemical variations can now be mapped far from the Apollo landing sites.-G.W.C. and H.M. 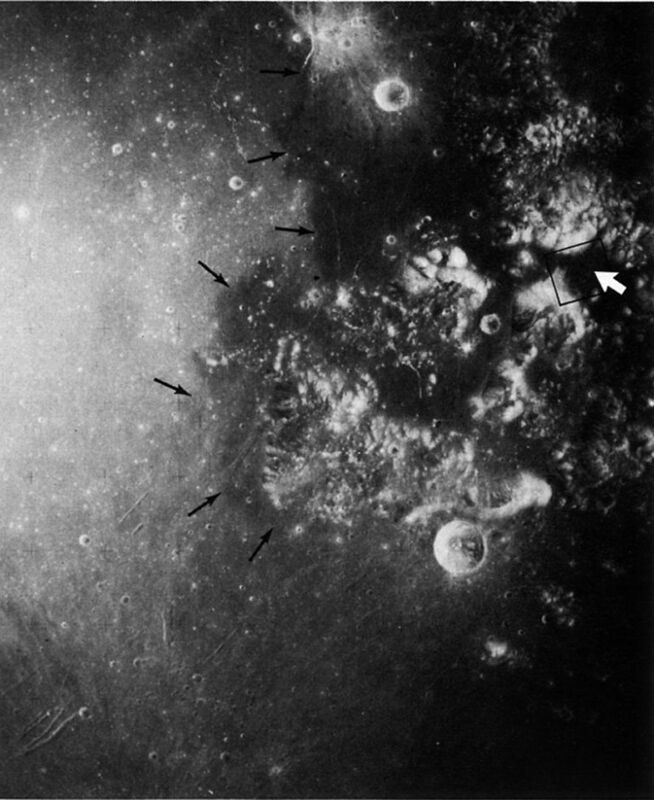 FIGURE 58 [above].-This mosaic of Apollo 17 frames extends across southern Mare Serenitatis, one of the larger multiringed basins on the Moon's near side (fig. 14). The average diameter of the basin is about 680 km. Its generally circular outline is mimicked by the systems of arcuate rilles near the outer edge of the basin and also by the large system of mare ridges extending from arrow to arrow. Another feature of Mare Serenitatis is the nearly continuous ring of dark mare material that occupies the outer part of its floor. When these pictures were taken, the Sun angle was too low to show differences in albedo clearly. However, part of the ring of dark mare material is visible near the Plinius Rilles (Rimae Plinius) and the Littrow Rilles (Rimae Littrow). 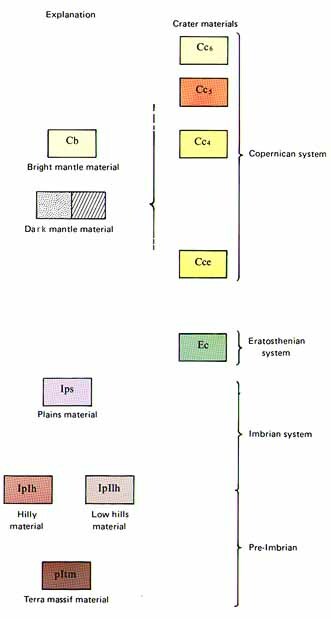 The stratigraphic relationships between the dark and light mare units are described in figure 59, which is an enlargement of the small area outlined in this figure.-G.W.C. FIGURE 59 [left].-Some of the strongest tonal, color, and structural contrasts among mare materials occur in Mare Serenitatis. Accordingly, it has become a classic area for studying the sequence (or stratigraphy) of mare rocks. Earlier studies of telescopic photographs seemed to provide evidence that the lighter materials in the center of the basin (top half of this view) were emplaced before the darker lavas erupted along the basin margin. However, pictures returned by Apollo 17 show that the opposite is true. The dark materials were emplaced first. They were then tilted northward and broken by faults, such as those that bound the Plinius Rilles, before the light lava flooded against them (Howard et al., 1973). The large mare ridge or wrinkle ridge deforms both light and dark mare units but is much more prominent in the lighter unit. Detailed spectral studies and visual observations by the Apollo 17 astronauts show that the lighter-toned mare is relatively browner and the darker mare is relatively bluer.-K.A.H. 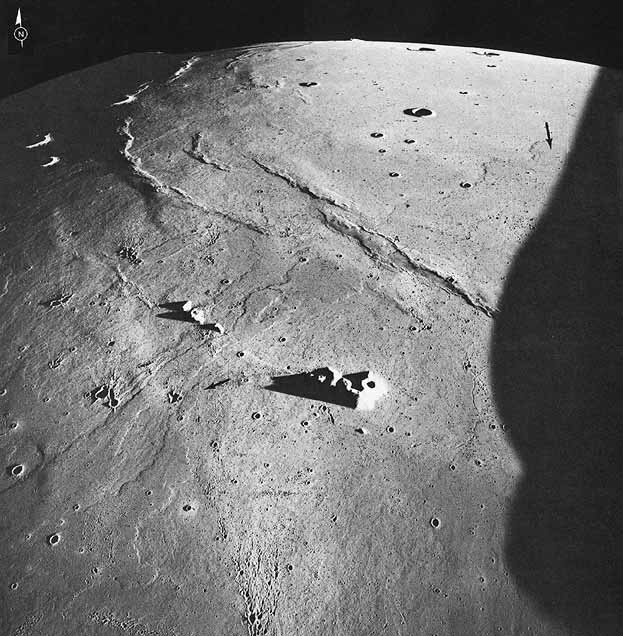 FIGURE 60 [right].-The southeastern margin of Mare Serenitatis and the surrounding Taurus-Littrow highlands are shown in this high Sun angle photograph. 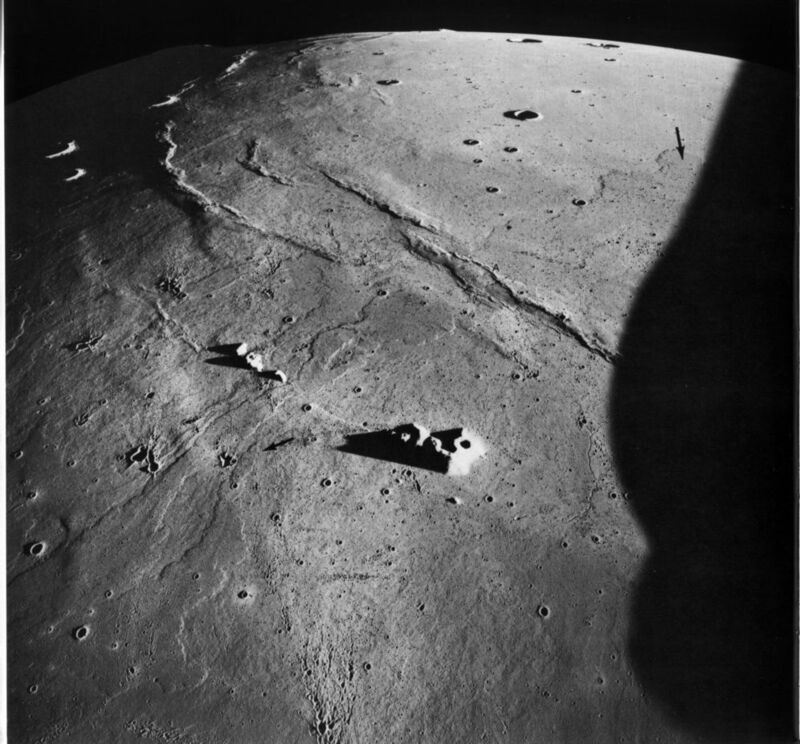 Also shown is the Apollo 17 landing site (large arrow) in a dark-floored valley between bright mountain massifs. The rectangle surrounding the landing site outlines the area covered by the two maps that follow in figures 61 and 62. 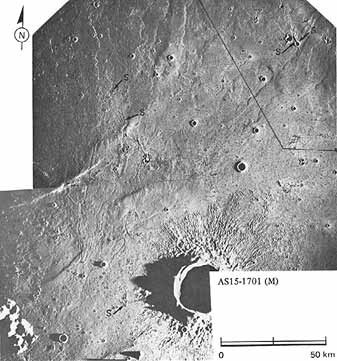 The boundary between light mare material in the central part of the basin and the very dark mantling material surrounding the landing site area is indicated by several smaller arrows. The difference in albedo is much more pronounced in this picture than in the mosaic (fig. 58) at the beginning of this chapter because this picture was taken when the Sun was at a higher angle above the surface. Before the Apollo 17 landing, the dark material was interpreted to be a blanket of pyroclastic debris (volcanic cinders and ash). It was thought to be as young as Copernican in age (see fig. 13), and hence younger than most other mare materials elsewhere on the Moon. Analysis of samples returned from the Taurus-Littrow area has shown that while the dark material may be predominantly volcanic in origin, its age is considerably greater than had been predicted. The dark mantling material most likely consists of black and orange glass beads that form a layer on top of the valley floor basalt and are reworked into the regolith, thus causing the low albedo. -B.K.L. 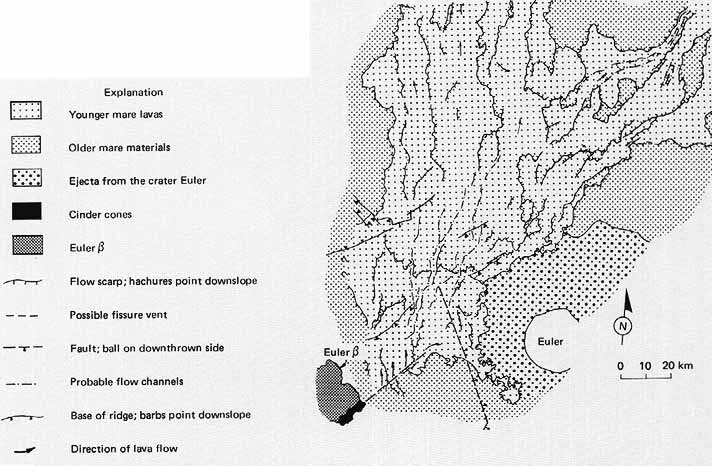 FIGURE 61 [above].-This is part of a premission geologic map of the Taurus-Littrow area, compiled by B. K. Lucchitta (Scott, Lucchitta, and Carr, 1972) and published before Apollo 17 was launched. The actual landing point was very near the center of the large circle marking the proposed landing site. Letter symbols and colors designate the different types of rock materials and their relative ages as deduced from study of photographs available before the mission. Some refinements could now be made based on samples and data gathered by the astronauts on the surface and from orbital experiments. Apollo 15 panoramic camera photographs were the principal source of information for the original map, but mapping camera photographs, Orbiter pictures, and Earth-based telescopic pictures were also used. Dotted where buried; buried unit in parathensis. ....very brief interpretation of its origin and history. 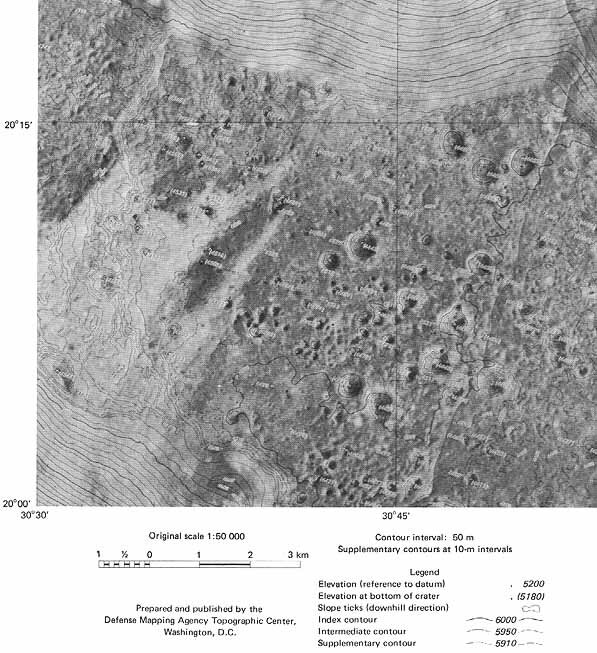 For example, unit pItm occurs on the steep hills north and southwest of the landing site and is interpreted to be composed of ancient rocks uplifted when the Serenitatis basin was formed. Unit Ips is a much younger, relatively smooth plains material that covers most of the Taurus-Littrow Valley. Before the mission it was interpreted as ejecta breccia or lava emplaced in a fluidized state; samples and other data gathered during the mission confirmed it was mare lava. Dark mantle material is shown by dot or line shading rather than by letter symbols and color. Throughout most of the valley it appears to be on top of (hence, younger than) unit Ips. It was interpreted as a blanket of pyroclastic debris. Unit Cb, bright mantle material, was interpreted as a deposit of avalanche debris derived from the steep mountain partly shown in the lower left corner of the map.-G.W.C. FIGURE 62 [above].-This is a topographic contour map of the same area as the geologic map in figure 61. Topographic contour lines in red are superposed on an orthophoto base composed of rectified and mosaicked panoramic camera frames. The area shown is part of a larger map prepared by the Defense Mapping Agency Topographic Center and is included here to show the relationship between geology and topography. The steepness of the mountain slopes along the north edge and in the lower left corner is indicated by the closely spaced contours at 50-m intervals. These slopes are underlain by the very old rocks of unit pItm. The overall levelness of the valley floor-the area filled by younger rocks of unit Ips-is indicated by the widely spaced contours at 10-m intervals. An exception is the belt of closely spaced subparallel contour lines extending northward near the left edge of the map. These define an east-facing scarp or mare ridge interpreted on the geologic map as a fault. The average difference in elevation across the scarp is about 80 m, suggesting at least that much vertical displacement across the fault. The location and size of craters on the valley floor are shown by the many sets of circular contours.-G.W.C. FIGURE 63 [above].-This stereoscopic view shows southwestern Mare Serenitatis "lapping against" its shore of ancient highlands or terrae. The highlands near the Sulpicius Gallus rilles in the lower part of the picture are unusually dark-- darker even than the mare. M. H. Carr (1966) suggested from telescopic study that the darkness of the highlands is caused by a thin mantle of dark material, perhaps consisting of volcanic ash. The numerous small bright spots are knobs of highland material. They may have once been covered by the dark mantle but, if so, have since shed it. As elsewhere around the outer part of Mare Serenitatis, the rilles and the dark mantle in this area were originally thought to be younger than the lighter mare to the north. Apollo 17 photographs such as these have changed that concept. Now, the lighter mare is interpreted as embaying the faulted dark materials, just as in the Plinius rilles area (figs. 58 and 59). Isolated islands of dark mantled highlands that escaped inundation are shown by the arrow. K.A.H. 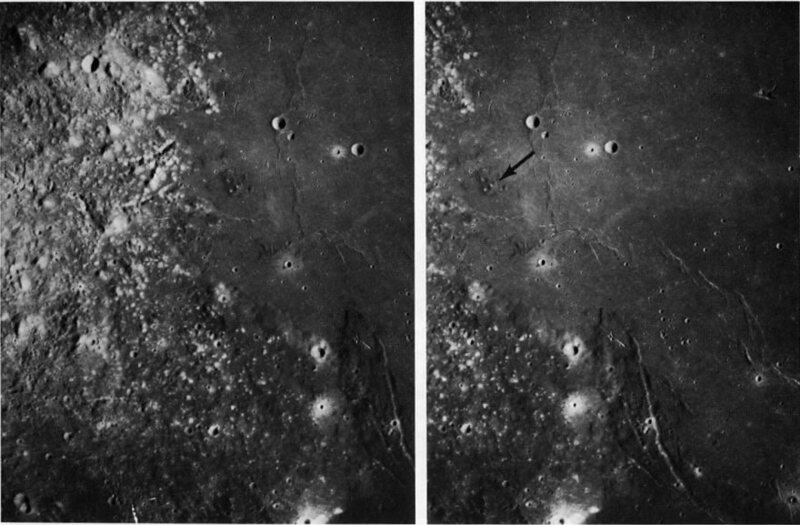 FIGURE 64 [above].-These two contrasting pictures of the same area in southeastern Mare Imbrium were taken by Apollo 15, but on different revolutions under different lighting conditions. The picture on the left was taken when the Sun angle was 17°; the Sun angle was 2° when the picture on the right was taken. The large crater at the west edge is Timocharis. The area is dominated by three geologic units. The oldest is a fairly densely cratered fractured plains unit of moderate albedo that occupies the eastern part of the area. Next oldest is the mare unit in the central part, with its typically smooth, level surface and moderately low albedo. The youngest unit is the bright (high-albedo), highly textured ejecta surrounding Timocharis. We have included the two pictures to illustrate the problems photogeologists sometimes face when drawing a contact line between units. The eastern edge of the mare is used as an example. Throughout most of the area shown the mare is in contact with the plains unit. Characteristically mare material is darker and smoother than plains material. Using the picture on the left in which albedo differences are enhanced because of the relatively high Sun angle, the contact might be drawn as shown. The line is equivocal in places, but, in general, it does satisfactorily separate darker areas from lighter areas. Using the picture on the right, in which surface relief is exaggerated because of very low Sun angle, the contact would be drawn as shown. Some areas dark enough to be mapped as mare in the first picture are here seen to be too roughly textured to be mare. As drawn, the line separates a unit that is both dark and smooth from a unit that is predominantly light and everywhere rugged. Detailed stereoscopic examination of all available pictures of this area explains why some dark areas within the plains unit should not be classified as mare. In several of them there are structures resembling volcanic outlets (wide arrows on left photo). Similar structures were not found elsewhere within the plains unit. Therefore, it is likely that some if not all the darker areas of the plains are caused by veneers of dark volcanic ejecta so thin that the surface relief of the underlying plains is still visible. An additional point of interest is the clearly defined sinuous rifle (small arrows in right photo) that extends half the length of the picture; the same rifle is almost invisible in the other picture.-G.W.C. 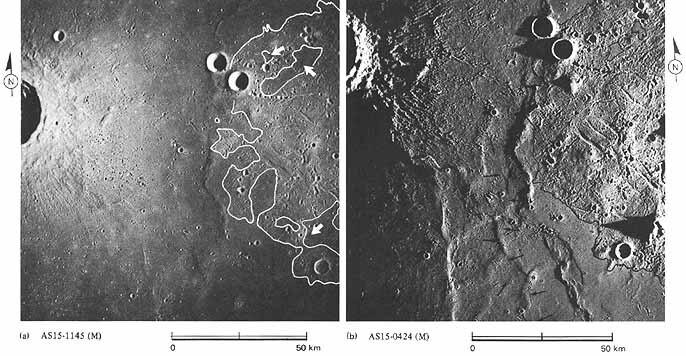 FIGURE 65 [right].-This photomosaic of an area of relatively young mare lavas in southwestern Mare Imbrium shows a complex of overlapping lava flows. The complex has been traced to its apparent source northeast of the mountain mass Mons Euler (formerly called "Euler B [Greek letter beta]") where the approximate location of a fissure has been deduced by detailed geologic mapping (Schaber, 1973). Individual flows are recognizable in this low-Sun (about 4°) picture as elongate lobes bounded by steep scarps. They are shown on the accompanying sketch map. Many contain one or more small rilles that are interpreted as flow channels. As individual flows are traced southward toward their source, they narrow and converge or terminate in the vicinity of the postulated fissure. South of the fissure distinct flow scarps are absent. A row of dark volcanic cinder cones along the southeast side of Mons Euler is alined with the postulated fissure, further strengthening the idea that this is an area of eruption. It is likely that the fissure is covered by its own lavas. The succession of geologic events in this area is easily decipherable. 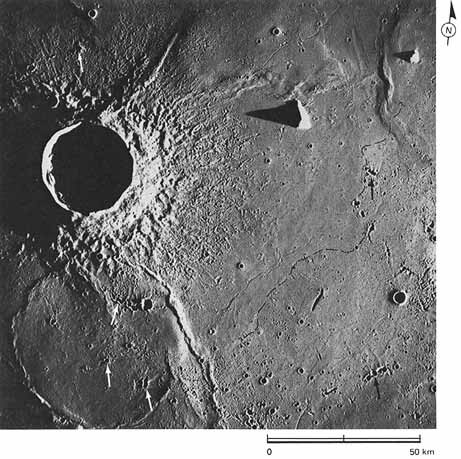 Secondary impact craters (as at S) from the large crater Copernicus overlie the lavas; hence the lavas are pre-Copernican, or Eratosthenian, in age. In turn the lavas have inundated part of the ejecta from the crater Euler; therefore, Euler is also pre-Copernican. 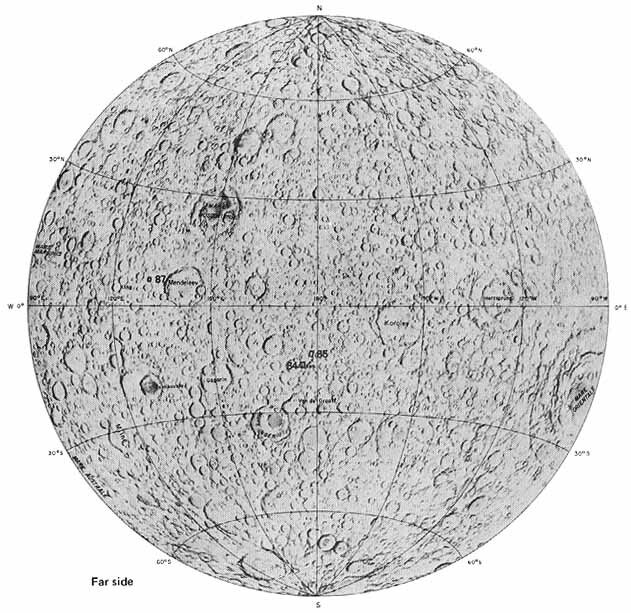 Before Apollo pictures became available, it had been mapped as a Copernican crater. At the present time, only the lavas can be assigned an absolute age. About 2.5 billion years old (Schaber, 1973), they are older than all but a very few rock outcroppings in the entire United States. On the other hand, they are much younger than most, if not all, the samples collected on the Moon during the six lunar landings. Solid line shows position of lower left corner of figure 66.-G.G.S. 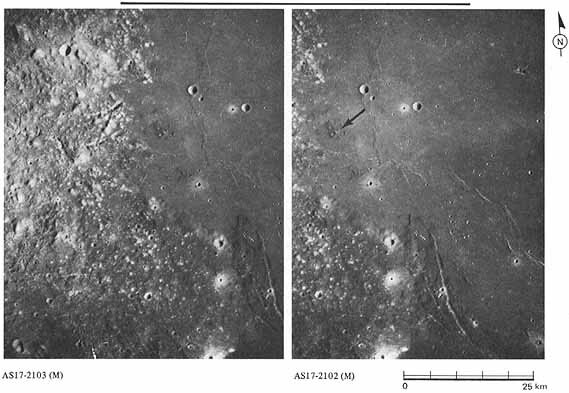 FIGURE 66 [below].- Two of the younger lava flows described in figure 65 are here followed northeastward to their terminations (see arrows) near the center of Mare Imbrium. The narrowness of the flows is somewhat accentuated by the obliquity of this view. From the postulated fissure vent near Euler B [Greek letter beta] to the farthest terminal lobe is about 420 km. The mare ridge at A must have been nonexistent or at least much more subdued at the time the flow passed that point, otherwise the flow would have ponded behind the ridge. 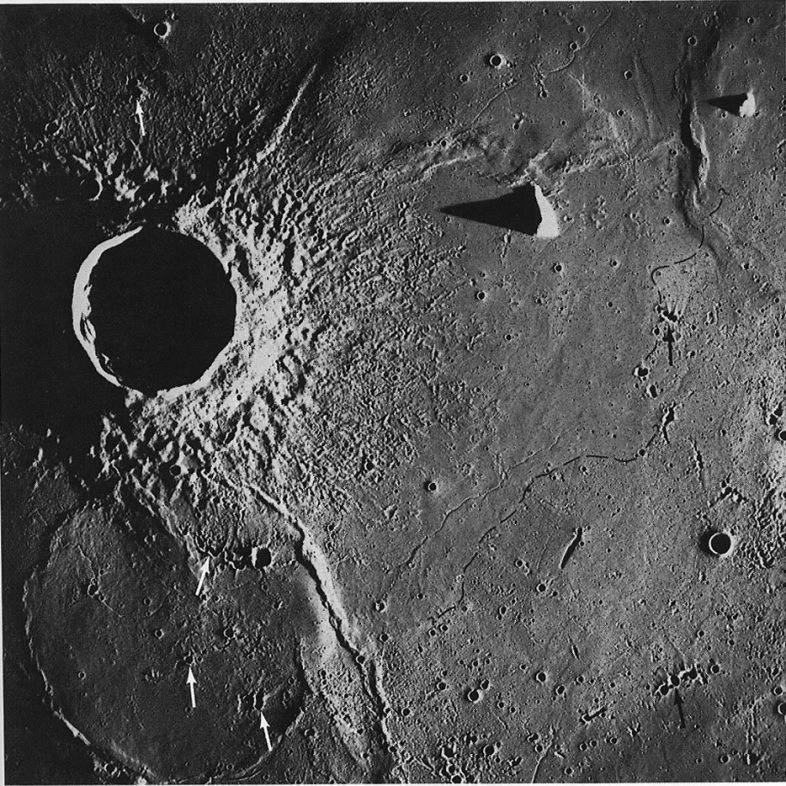 The spray of irregular craters in the center foreground was formed by material ejected from Copernicus, 460 km to the south.- G.G.S. 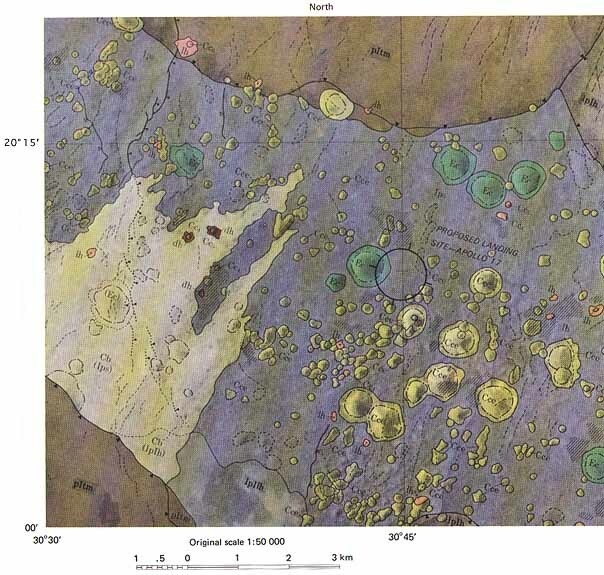 FIGURE 67 [above].-This area is east of that covered in figures 65 and 66; the large crater is Lambert. Here also lava flows of more than one age are present. A sinuous band of smooth, sparsely cratered mare extends northeastward through the center of the picture. It is most certainly a young lava flow and contrasts strongly with the much more densely cratered older mare southeast of the dashed line marking the contact between the two. The western boundary of the young lava flow clearly laps upon and embays the blanket of ejecta deposits surrounding Lambert. Many radial ridges of ejecta and radial grooves or chains of secondary craters radiating outward from Lambert are faintly visible beneath the younger flow near its western boundary. These relationships prove that the younger flow postdates the formation of the crater. Many clusters of secondary craters from craters other than Lambert are present. The shape, orientation, and freshness of some (indicated by arrows) lead us to believe they were probably formed by ejecta from Copernicus, which lies 360 km further south. They are present on the older mare, on the ejecta from Lambert, and elsewhere around this area. However, none is present on the younger flow. If this observation is supported by further study, the younger flow must postdate even the crater Copernicus, and thus be younger than any other extensive lava flow recognized to date.-H.M.